Family Chiropractic Center is one of a few practices that offers this high level of laser therapy in the country. Laser therapy works by detecting cells that are functioning below normal frequency and triggering them to create healing proteins that bring them back to life. Laser therapy has been proven to help a wide array of acute and chronic conditions including arthritis, degenerated discs, scar tissue, chronic pain, acute sprains/strains, and many more! Download our laser therapy brochure to learn more. Laser therapy exponentially increases the rate of healing and strongly encourages, especially in chronic conditions. A longtime Family Chiropractic Center patient and former military veteran initially came to us with severe pain caused by an ill-performed low back surgery. Day in and day out, he was living with such intense pain that it would often cause him to walk into our practice with tears streaming down his face. After multiple unsuccessful trips to the emergency room, Dr. Annie was able to utilize laser therapy to address the cause of his severe discomfort. After a course of laser therapy and several adjustments, his pain went from 10 out of 10 on the pain scale to a 0. But even more than that, he has been given his life back – not living in fear of his next pain attack, not worrying about having to take prescription medications, able to live the life that he deserves! 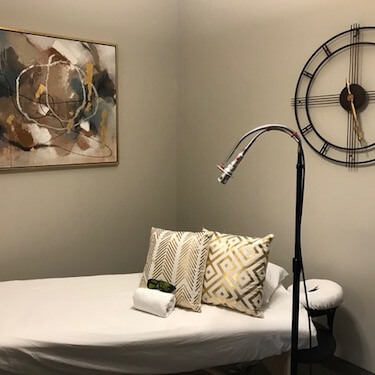 Although Family Chiropractic Center thoroughly believes in the science behind laser therapy and has seen its effectiveness time and time again, it is not always successful. With a success rate of 85%, Dr. Annie has seen rare cases where the cells are so degenerated that they are not living or functioning at any capacity, and they cannot respond to the light. There’s no risk to care – if you aren’t seeing any positive results after 10 visits, a full refund will be granted. No questions asked. Laser Therapy is safe, effective and risk-free. Find out if you’re a good candidate for laser therapy by contacting our practice today to book your first visit. Want to read more about how the laser has helped others?